Three new biology laboratories in the Science Center recently got an open house debut. The spaces were made possible by a 2012 addition, which opened up space in the existing building. The new biology labs complement new chemistry labs that came with the addition. "It's nice to have facilities that are up-to-date in the sciences," said Nick Lambrecht, a senior biology major who plans to attend graduate school for microbiology. "It really helps out us students and the teachers. The environment works better." The second-floor labs are "just beautiful," said Jane Wattrus, instructor of biology. "We're all excited for the new space. It enables more activities and lab space for everything. It'll be really nice to not have to get up and get a shared space ready at 6 a.m. for an 8 a.m. class. This way we have our own space with the materials all ready for us." 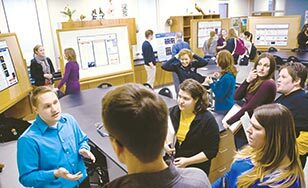 The open house showed off the new biology labs' usefulness for classes, projects, and experiments. Students had prepared poster boards and short presentations representing their work as individuals and as groups including the Pre-Med Club, the Biology Club, and Physical Therapy Department staff and students. "We're now able to do more research as students," Lambrecht said. "This means getting better opportunities for internships, and that's great."